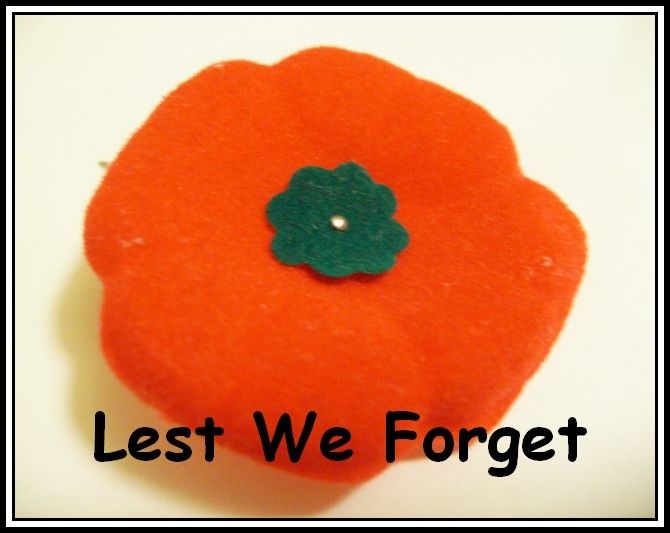 It will Remembrance Day here in Canada ( November 11), Lest we Forget those that Served in the Wars. My Dad was with the Royal Canadian Air Force ( RCAF ) Ground Staff for WWII. This Poppy I posted is a 1970's Vintage Canadian Felt Poppy to wear on your Jacket. This one has the *GREEN* felt center whereas the newer ones have a *BLACK* felt center. From around the 1970's era. I just always had kept a few and now down the Road when they changed the center color. Who knew -- it now became a Collectible.....But to me....being able to say My father served for the War is a Proud thing!! Great post, rose, having fews family members myself has serving during the war, always nice to not forget those one. Rose, I love the post and the poem. My oldest Son is serving in the US Army. We're proud of him, but worry about him being deployed. Thank you to all the veterans out there!! Thank you for posting this. Amnesty day. Great post rose. I'm proud of all who served for us. Thanks to all of them. Sadly only the dead have seen the end of wars. God bless them. Wonderful poem Rosie, and thanks for sharing! Thanks for the ~ LOVES ~ and sorry for the delay!! ..@jscott0363 --> Thanks, and Tell your Son he is everyone HERO !! ..@Caperkid --> So True, God bless them all, never forget !! ..@Rick55 --> Thanks Rick. I guess as a first generation daughter of a War Vet from WWII, really strikes a special cord with me!! I am going to contact the RCAF to see if I can get my Dad's records -- why not -- it is part of our Heritage and history in this family ! !